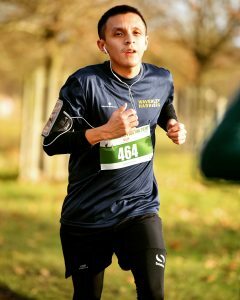 In April, Steven will be running the London Marathon in aid of The Brain Tumour Charity. He has written an article which he has kindly shared with us. Thank you, Steven – and GOOD LUCK! I’m running a marathon this year – a sentence I never thought I would say. But here we are. I am going to try and put a bit of background into why I started running and the benefits I feel it has for both your physical and mental fitness. Rewind 12 or so years ago, whilst I was studying at Gunnersbury Catholic School in Brentford, London. We took part in a run around our two playing fields (one lap of the small, and 2 of the large field), this was a yearly occurrence and something I used to dread. If I finished in the bottom 10 (out of circa 180 students in the year) that was impressive. You could say, running was not my favourite thing at all. In the time since then I occasionally played football, both at university and for my local team, however it never really stuck. I was lucky enough to be part of the winning team for my previous job, Wetherspoons in their Regional football ‘Kick for CLIC’ raising money for their charity partner, CLIC Sargent. This gave me the 1st taste of success in a competition for a long time (we had narrowly come runners up the year before). If you had told me while I was struggling around my school playing fields that I would be training for my 1st marathon today I would never have believed you. I am currently training to run The London Marathon for The Brain Tumour Charity, where I currently work. The Brain Tumour Charity is the world’s leading brain tumour charity and the largest dedicated funder of research into brain tumours globally. Committed to saving and improving lives, we’re moving further, faster to help every single person affected by a brain tumour. Because we understand that when you, or someone you love, is diagnosed with a brain tumour – a cure really can’t wait. Competitiveness is a trait that I am both lucky and unlucky to have. My first run since the aforementioned school runs was on Boxing Day 2017. 2017 was a difficult year, both personally and professionally. I had just moved jobs, from an entirely different sector as well. Everything was new. I had just returned to exercising regularly, going to the gym a few times a week. On Boxing Day I woke up very full of both alcohol and food so decided to head out for a 7am run. I ran just over 3k in 32 minutes and it hurt. A lot. I told myself this was a bad idea and actually did not run again until April. A few runs here and there happened after. And then nothing again until May when I started running at work during lunch. This quickly turned into a weekly occurrence, rather than a one off. And with that, my time improved. My first race was The British 10k in July, which was in 30 degree heat and unfortunately I picked up an injury while training in California. I finished in a time of 63.09, happy that I had finished but disappointed at the injury and time. A great memory was seeing a good friend, Chandos run The London Marathon in 2018. His perseverance was an inspiration and to be able to join him for the last few miles was a pleasure. I signed up to the ballot for 2019, not thinking too much as I had heard countless stories of people applying for years and never being successful. On the 9th of October I received the news, I had been SUCCESSFUL in the ballot and had won a place in The London Marathon 2019. I couldn’t quite believe it, first time lucky. I am not sure if I was excited or scared at that time, as I had never even thought of running more than 10k. Nevertheless, I realised it was once in a lifetime achievement so paid my entry fee and was officially signed up and raring to go. It was an easy decision to choose to run the marathon for The Brain Tumour Charity. I see first-hand every day the impact we have on our community so wanted to help that little bit more and help raise some money. Since then I have joined my local running club, undertaken a few more challenges, signed up to a Half Marathon in February as well as getting a PB of 50.14 for my 10k. A remarkable 13 minutes taken off after my effort at The British 10k in 2018. Now it is easy to say that you don’t have enough time to run, or to go to the gym. ‘I’m too busy, it’s too dark outside, it’s too cold, and it’s winter.’ A lot of people attribute spending time exercising to losing time to do other things you enjoy, going out, seeing friends, focusing on work, etc. However, since I have started running I feel the best I have ever felt, I have never had this much energy before. Yes training for a marathon is time consuming; my plan has been going since October and is a struggle to push through sometimes. However it has made me much more active and as a result I have more energy to do what I want. I was able to go out drinking still, I still went on trips to California and Scotland, and if anything I probably saw my friends more, especially people I had lost touch with. Running has also improved my productivity at work, with more energy to use, the days don’t seem as hard now, especially when I have to travel a lot. Running has also reminded me of something very important that I overlooked for a long time; to take some time out for yourself. Something we can lose track of very easily. All in all, making the decision to start running has been one of the best I have ever made. I feel the fittest I have ever felt and raring to go for the next challenge. I am lucky to have a solid network of my family and friends to keep me going for this challenge (God knows I will need it to cross that finish line). So here’s to never giving up. Life will throw you a lot of curve balls and bad news, but ultimately it is your resilience in how you handle this that affects your future. It’s you vs you. So get out there, and chase your dreams.